Aaaahhhhh. It's here. It's finally here. The day girls all across the country dream of. Pink hearts and red roses...chocolate and sparkly things...unicorns and glitter (I'm with Flo...). They wake up in the morning with their hearts all a-flutter, convinced that the birds are chirping louder than usual. They pull on their crisp, clean outfit with the softest touch. They paint their nails in glorious hues of love and passion. They slide on their sexiest, spike-heeled boots or slip into their sweet little kitten heels. They go through the motions of the day, anticipation in their every move. ...just in time to flip open their laptop and check out the first post in the Joy the Baker Cookbook Spotlight & Cook-Off! They can barely contain the moans...the gasps that threaten to slip past their perfectly lacquered lips. Chocolate. Fudge. Buttercream. FROSTING! And just like that, they knew the wait was worth it. 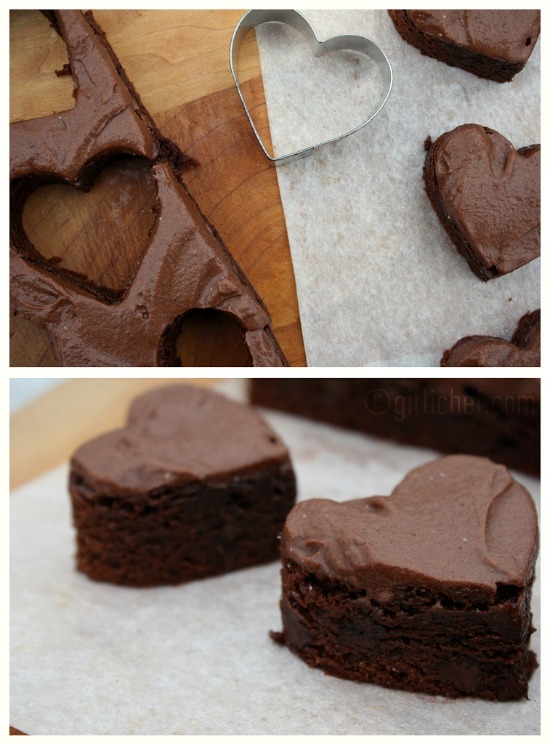 Chocolate and hearts. Love and ecstasy. 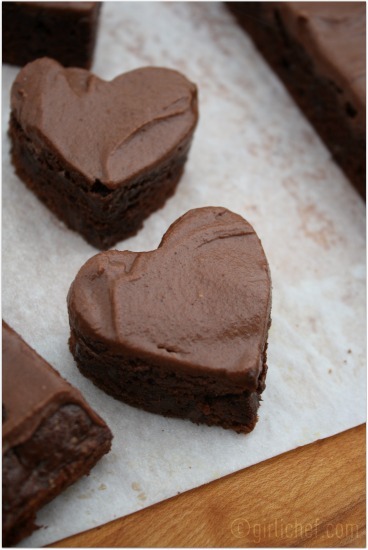 It was everything a brownie should be. Rich and fudgy with the smoothest, creamiest, most seductive chocolate frosting in existence. Yes. Girls all across the country will fall asleep satisfied tonight. Place rack in upper third of oven and preheat to 350° F. Grease and flour an 8 or 9-inch square baking dish and set aside. 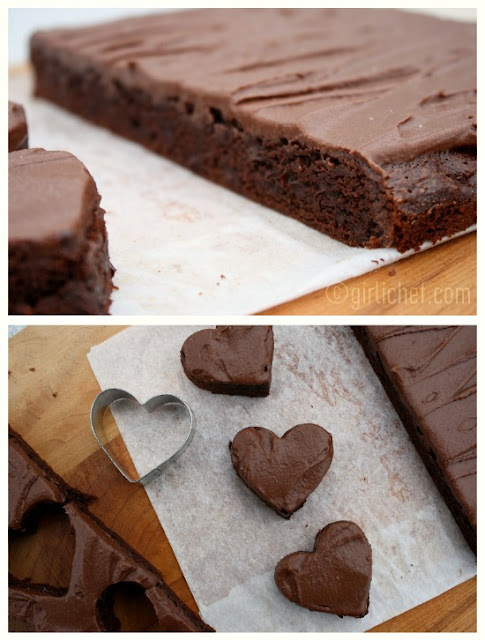 If you want to be able to lift the whole square of brownies out of the pan, line it with a long strip of parchment paper (to form a cradle), greasing and flouring that, as well. Bring a couple inches of water to a boil in a medium saucepan. Set a heatproof bowl containing the butter and unsweetened chocolate over the top of, but not touching the simmering water and allow to melt. (Or do it carefully in the microwave.) Stir to incorporate. Remove from simmering water once melted. Whisk in both sugars. Whisk in eggs, yolk, and vanilla. Add the flour mixture all at once to the chocolate mixture, stir well to combine. Fold in chocolate chips. Pour batter into prepared pan and bake for 25-30 minutes (8" pan) or 20-24 minutes (9" pan), or until a skewer inserted in the center comes out clean. Remove from oven and cool completely before frosting. Cream together butter, cocoa powder, and salt with the paddle attachment of an electric mixer, for ~3 minutes. Mixture will be very thick. Turn off mixer, scrape down sides of bowl and add 2½ cups of the powdered sugar. Turn mixer on low to incorporate sugar while adding the milk and vanilla. As sugar incorporates, gradually increase mixer speed to medium-high. Stop & scrape down sides of bowl as needed. Beat until smooth. Stir together cream and Ovaltine. Turn the mixer to medium, and pour the cream in a slow and steady stream until frosting reaches your desired consistency, adding more powdered sugar, if needed. Frosting should be smooth, creamy, and spreadable. Spread half of frosting onto cooled brownies (use the rest for cake, cupcakes, cookies, graham crackers, eating from a spoon, etc.). Frosting will last, well wrapped, for up to 5 days in the refrigerator. 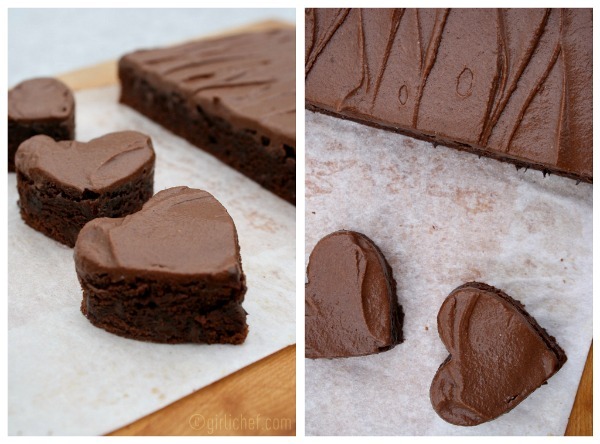 Brownies will last, well wrapped, for up to 5 days at room temperature. Oh yeah. And it's Valentine's Day...and my Anniversary. 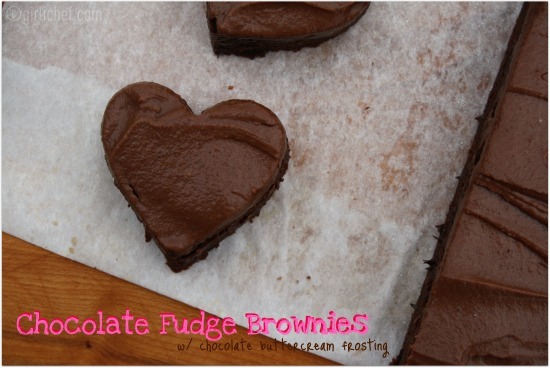 Happy Valentine's Day everyone - I wish you many Chocolate Fudge Brownies with Chocolate Buttercream Frosting...and Happy Anniversary, mi amor! Such a simple yet delicious idea. Love this! Yum. I actually almost made this today. Looks great. Happy anniversary!! So cute, I love that you made hearts with these. Your photos are gorgeous!! I did hearts with the crackers, lol. I will be dreaming of chocolate heather! These are amazing! I love the hearts!! !Happy Valentine's day! Happy Anniversary & Happy Valentine's Day! So cute! I will definitely be making these soon! Thanks Trix! I saw your heart crackers ♥ (I made a few, too)! These are so pretty. And ohmygoodness they look delicious. Thanks for sharing on Crazy Sweet Tuesday! Happy Anniversary Heather! These were so good - chocolatey rich - but good. Love your pics and the great heart shape. Enjoy your Valentine's Day! Happy Anniversary, Heather! Great idea to make hearts. Your pictures make me want to bake these all over again. Looks so delicious. Can I get a lick at them? Happy valentines. Que bonitos y que buenos. Woohoo! And what a way to kick off the spotlight. I'm posting my brownies on Friday. And dang were they good. They came out so pretty; never would have thought to pretty up my brownies like this; Hope you are having a good one. Love these, especially that you frost them before you cut.. Makes it so much easier. Happy Valentine's Day! These are cute! Happy Valentine's Day, Heather! Happy Valentines Day to you and your family Heather! Happy Anniversary and what a way to celebrate, love the hearts and am still kicking myself for not frosting these bad boys.. yummy!! Belated Anniversary wishes! So fun to celebrate your anniversary on Valentine's Day, more reason for oodles of fun and food! 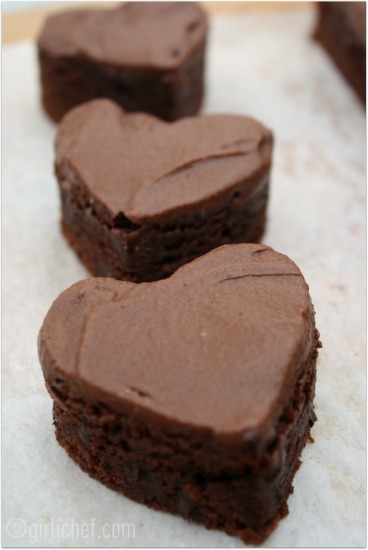 :D These brownies look awesome as part of your celebration! These look beautiful, and so, so delicious! Thank you for sharing them. I hope you and your husband had a lovely anniversary, and a very happy Valentine's Day! your photography and food styling is getting so good! i went with the crackers, but now thinking maybe i should have made the brownies too! thank you for organizing this great cookbook cook off!